Australia's David Warner plays a shot during the 4th ODI cricket match against India at Chinnaswamy Stadium in Bengaluru. BANGALORE (INDIA) - Australia's David Warner hit a belligerent century against India to mark his 100th one-day international on Thursday. The batsman got to his milestone with a boundary off part-time spinner Kedar Jadhav, jumping for joy as the runs were marked up. He later fell to Jadhav's off-spin and walked off to a standing ovation. The 30-year-old Warner is the eighth batsman in world cricket to register a ton in his 100th ODI with West Indies' Gordon Greenidge being the first against Pakistan in 1988. 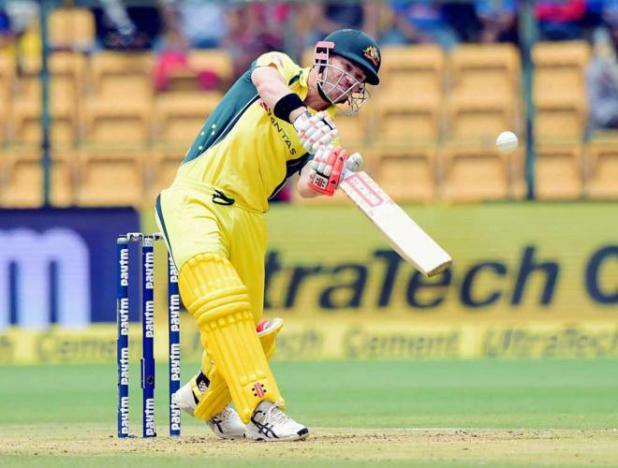 Australia's David Warner hit a belligerent century against India to mark his 100th one-day international on Thursday.